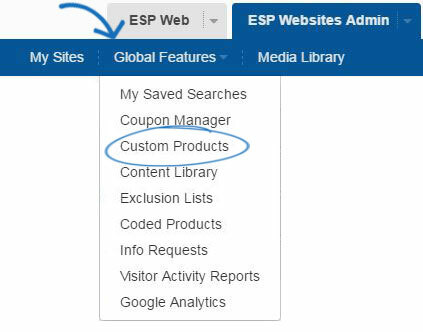 To upload additional product images for a custom product, log into the ESP Websites admin and from the Navigation Toolbar, hover on Global Features and then select Custom Products from the dropdown. In the Manage Products area, locate the product you would like to add images for and click on the Edit button. Click on the Choose button in the Upload Product Image section. You can upload as many product images as needed. To upload a specific image, click on the Choose button and select the image file from your computer. If you want to select more than one image at a time, hold CTRL on your keyboard as you select images. Click on Open and then click on the Upload button. A thumbnail of the uploaded image(s) will be displayed in the Manage Images section. Click the Preview Full Size link to view the image in its actual size. Click the “X” to remove an uploaded image. The first image that was uploaded will automatically be set as the default product image. To designate an image as the default, click on the "Set as Default" link. You are also able to use the Media Library to select from already uploaded images. In the Select from Media Library section, click on the Media Library button. A window with all previously uploaded images will display. Click the checkbox in the lower right corner of the image you would like to use. 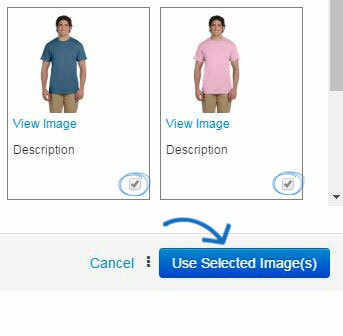 After making your selection, click on the Use Selected Image(s) button. To add Tags, drag and drop options from the Attach Criteria to a Product Image section into the Tags box located under the image. By adding tags to an image, you are establishing a direct relationship between the image and the product attributes in the tags. Tagging images will help visitors to your site retrieve more accurate results. For example, you have uploaded images of a mug in three colors (red, blue and green) and tagged each image with the corresponding color. When a visitor searches for "red mug", the image of the mug in red will be displayed in the ESP Website/Company Store search results. Note: It is important to only use one attribute when tagging.